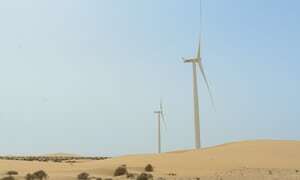 The abundance of sun and wind is increasingly attracting foreign firms to invest in Morocco’s south, the Sahara, as the government set the target of generating 50% of its energy mix out of renewable sources. The recent announcement by Soluna, a New York-based computing company backed by Brookstone Partners, to build a wind-powered center in Dakhla came as a confirmation of the attractiveness of the legal framework and investments incentives offered by Morocco in the Sahara southern provinces. Much to the frustration of the Polisario and its Algerian mentors who have led a losing battle to dissuade companies from contributing to Morocco’s development. On the ground, Morocco made proof of relevant reforms and forward-looking energy choices at a time Algeria is bogged down by utter dependence on non-renewable energy sources. Soluna’s move to build a wind farm in Dakhla is also pioneering in as far as it will be an off-grid electricity generator to power cryptocurrency mining. The company is developing its 900-megawatt, 37,000-acre wind farm in a class I site where winds exceed 22 miles per hour. This plant will add to another 201 MW wind farm launched by Moroccan company Nareva in Boujdour for a total cost of €400 million. In Tarfaya, a complex stretching more than 100 square km across the Saharan desert was launched in 2015. Its 131 wind turbines grinding out enough electricity to power a city the size of Marrakech every day. Morocco has also launched a new development model for the southern provinces that aims at strengthening infrastructure to prepare conditions for investments.